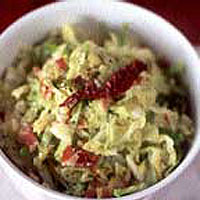 Bacon, especially if it's smoked, gives an excellent flavour to vegetables, and cabbage is the perfect companion. This dish is excellent with all roast meats. Make sure you find a good, firm Savoy cabbage with plenty of white heart, although the outer green leaves are very tasty too. Quarter the cabbage, discard the outer leaves and cut away the core. Slice the leaves very thinly. Heat the oil in a large saucepan over a medium heat. Add the bacon, garlic and chilli and fry for about 2 minutes. The garlic mustn't brown. Add the cabbage and water and season to taste. Stir well then cook, covered, for 10-15 minutes, or until the liquid has evaporated and the cabbage is cooked. Serve straight away.